Mufasa was the last animal left from a Peruvian circus that was forced to shutdown under new laws. Instead of the circus owners handing over the animals to special rehabilitation centres, they left their animals chained up in their cages. The only way the animals would be fed was by locals who continued to bring them food. 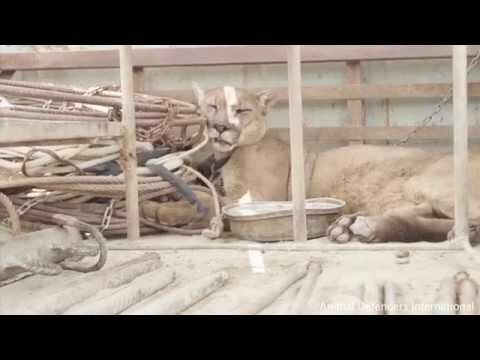 Mufasa had been been a circus cat and spent the most of 20 years chained up in the back of a truck. After getting help from the local police, members of the Animal Defenders Institution were ready to move Mufasa to an enclosure at a sanctuary, imitating his natural habitat. It was a big sigh of relief fro everyone, as Mufasa got to feel what it likes to live in a forest for the first time, surrounded by nature, just as he was supposed to from the beginning. Sadly, Mufasa was only able to live in freedom for a couple months before passing away. His health was irreparable after the many years of abuse and malnourishment he faced at the circus. It’s heartbreaking to know what he went through, but happy to know he was in a place he loved before he passed.